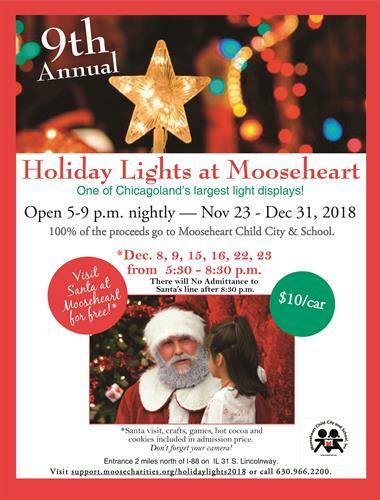 Join us for the 9th Annual Holiday Lights at Mooseheart! A tradition for over 15,000 families in the Fox River Valley you will love driving through the 1.8 miles of beautiful holiday displays on Mooseheart's historic campus! December 8,9, 15, 16, 22, 23 are all FREE Santa nights! After driving through the lights you are welcome to join us for cookies, cocoa, and pictures with Santa in the Fieldhouse!